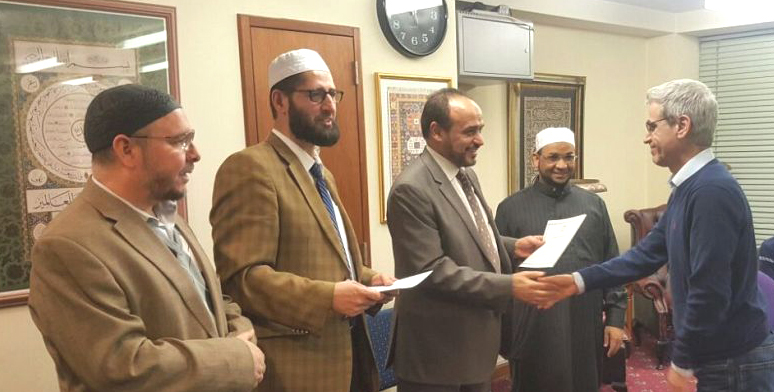 The five-month course of interpretation of the Holy Quran in Persian concluded yesterday at the Islamic Cultural Centre in London with an awards ceremony where the Director General and Head if Education at the ICC distributed certificates to students. The Director-General of the ICC Dr. Ahmad Al Dubayan stressed in his speech during the occasion on the importance of understanding the book of God and the need for sincerity in the request of knowledge in linear to achieving God Conciseness. Dr. Al Dubayan thanked the Head of the Dawah Office in Britain Mr. Abdulaziz Al Harbi for administrating and sponsoring the Course. In the end of the ceremony, the Director of the Centre distributed certificates to the graduates of the course, thanking them for their efforts and attendance. He stressed the importance of the mission of the Islamic Cultural Centre which gathers Muslims from all different backgrounds, cultures and community based in the United Kingdom. The ICC continues to hold such Tafseer courses in Arabic, English, Polish, Hausa and Kurdish.